It’s still not known exactly how many people died in the earthquake of January 12, but current estimates are that over 200,000 people have lost their lives. Reuters announced that figure could jump to 300,000 once all the bodies are recovered. A further 250,000 are said to be wounded and one and a half million people are estimated to be homeless. The earthquake, which measured 7.2 on the Richter scale, is one of the most lethal disasters in modern history. The aid which followed, or rather failed to follow, shows again what a morally bankrupt system capitalism is. Haiti has a double geographical misfortune. It lies on two fault lines (the Septentrional fault in the north and the Enriquillo-Plaintain Garden fault in the south), but perhaps even more disastrously, it’s situated right next to the USA. A former French slave colony, Haiti’s struggle for independence was won by 1804 (See The Black Jacobins by C.L.R.James), but was forced to pay 90 million gold francs to France for its freedom after Charles X (1827-30) sent warships to the island (the equivalent of $21.7 billions today). This devastated the economy and took 122 years to repay. The US invaded in 1915 and although troops were formally withdrawn in 1934, the US maintained fiscal control until 1947. The post war years have been marked by US interference which has left Haiti ravaged, impoverished, corrupt and politically unstable. It is a country which has never been able to shake off debt to the richer nations. Even before the earthquake it was crippled with IMF debt and in reality has been run by the UN since the 2004 coup which killed several thousand people. This has left it at the mercy of an international community which has blocked all attempts to spend UN ‘investment’ on programmes such as poverty reduction or agrarian development and instead kept it firmly on military expenditure. Not surprisingly then, Haiti is the poorest country in the Western hemisphere with a GDP of just $6.95 billions per year. Even before the earthquake some 80% of the population lived in poverty, over half living on less than one dollar a day. The food situation in Haiti was serious before the earthquake struck - with more than 2.4 million people considered "food-insecure". Such poverty has meant that the immediate effects of the disaster have been massively amplified. Although it was a well known quake zone (and although Haiti’s authorities were well aware of the risk of an earthquake of this magnitude), its buildings, unlike those in richer countries, were far from quake proof. The buildings in the quake zones of major industrialised nations sit on damping systems that allow them to ride out tremors that not only shake them back and forth but also twist them in the same movement. The simplest concrete structures in the capital of Port-au-Prince not only crumpled under the same strain, they were so badly built some had collapsed previously through shoddy construction, including a school in Pétionville which killed nearly 90 children in 2008. 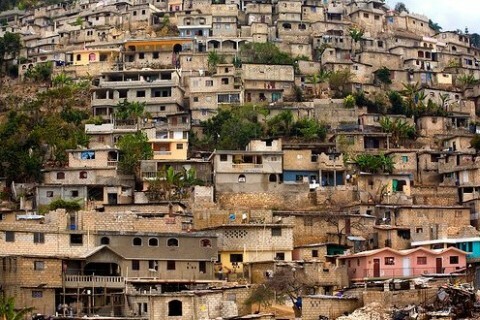 In cities like Port-au-Prince, many people live in poor and densely-packed shantytowns or badly-constructed buildings. Homelessness was rife before the disaster, and the fact that the poorest people didn’t have houses has been cited by relief organisations as adding to the crisis. According the Catholic relief group Caritas International, 70 percent of those displaced by the earthquake in the capital did not own their own homes before the disaster struck. Humanitarian Relief or Imperialist Security? MSF’s reports have been echoed by other agencies. According to the United Nations Office for the Coordination of Humanitarian Affairs (OCHA), the distribution of emergency shelter materials has been agonizingly slow. “As of 11 February, over 49,000 tarps have been distributed along with 23,000 family size tents,” OCHA reported. The Haitian government has insisted that its most urgent need is 200,000 tents-nearly 10 times the number distributed thus far. Much was made of the US military distributing food, but old imperialist attitudes die hard, and so do the racist attitudes that go with it. The US military carefully policed everything it gave away but did manage to distribute 10,000 meals a day until it decided it was attracting too many people so suspended work. As Lieutenant Brad Kerfoot said of the Haitian people, “My soldiers and I think they’re ungrateful”. While the victims of the disaster face starvation, the US and UN compounds keep a tight grip on the aid whilst themselves enjoying unlimited food, internet access and alcohol. In Pétionville, up the mountain from the capital, 360 US combat troops from the 82nd Airborne Division have set up camp around the Golf Club’s swimming pool and restaurant in order to ‘keep the peace’ and preserve the property of the businessmen and politicians who live in the area. At present over 40,000 homeless people are crammed onto the club’s nine-hole golf course, most without adequate shelter, water or food. The US showed its true priority when Defense Secretary Gates “wouldn’t send in food and water because, he said, there was no 'structure… to provide security'.” In fact the Pentagon’s first response to the earthquake wasn’t to help with the relief effort at all, it was to send in reconnaissance drones. In all some 22,000 US soldiers, sailors and Marines were dispatched, with combat-equipped troops immediately taking control of the airport, port facilities and presidential palace. Meanwhile, naval warships and Coast Guard cutters set up a blockade of the country’s coast to block the earthquake’s victims from trying to flee to the US. The role of the aircraft carrier USS Carl Vinson, is fairly typical. When it finally arrived in Haiti, (with Sidewinder missiles and helicopters), it did so without any emergency relief supplies. It refused to admit wounded Haitians to its large sick bay and temporarily blocked rescue flights to Florida. The US have refused to say how long they intend to stay in Haiti. General Douglas Fraser, chief of the US Southern Command, merely said the forces would be there as long as “necessary.” Where have we heard that before? It is estimated that 500,000 people have flooded in to the rural areas from Port-au-Prince and other affected areas under the encouragement of the Government. Conditions in the make-shift camps are unbearable. As one student, Markinson Midey, said: "Anytime they bring food or water, the police make the trucks leave." Aid agencies have criticized the government for failing to organize proper camps and a result many have returned to the countryside where they have families. The fact that they left in the first place because they couldn’t make an adequate living off the land has meant that the strain on the ‘host’ families who now care for them is creating starvation conditions in the countryside. In many cases people are resorting to eating the seeds they have stored for the next season and eating or selling their livestock. The implications for future food production are as obvious as they are terrifying. For those left in the cities, life remains tough. Thousands of demonstrators, most of them women, marched through the streets of Pétionville, a Port-au-Prince suburb recently denouncing the local mayor, Lydie Parent, for hoarding food for resale and not distributing it to the hungry. According to Reuters demonstrators are angry that a significant amount of food aid has been channeled into informal markets where some officials are making a fortune. So much for the US as the promoters of democracy then. As ever, the US is tightening its grip to make a fast buck while creating even more human misery. Once again the effects of a natural disaster have been made worse by the system we live under. The needs of the survivors should have been paramount. Instead survivors have been vilified, neglected, abused and attacked as the needs of imperialism and the scramble for profit dominated. Capitalism is about as far from a rational or humane form of social organization as you could get. Life is cheap under it, and the lives of those who have suffered this appalling disaster seem cheapest of all. If anything shows the incompatibility of capitalism with the needs of humanity it is the aftermath of the Haitian earthquake.